This is part 4 in a series of articles designed to help you choose the right Linux distribution for your circumstances. Which desktop environment should you use? Some of you will have computers that are really old and none of the solutions presented thus far are of much use. This guide lists those distributions designed to run with limited RAM, limited disk space and limited graphics capabilities. Ease of use is sometimes comprimised when using the really light distributions but once you get used to them they are every bit as functional as a Ubuntu or Linux Mint. Before I start I would like to say that unlike the other two lists this one is in no particular order. The AntiX website claims that you can run it on a Pentium II with 64 megabytes of RAM although it is recommended that you have at least 128 megabytes. 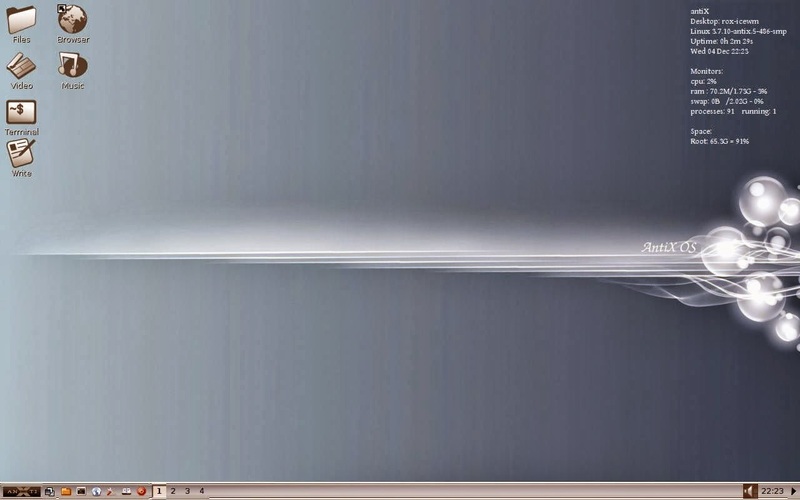 The download image for AntiX is just 690 megabytes in size. It is amazing how much is packed into that image. AntiX comes with dozens of applications and that includes the LibreOffice suite. All of the other applications are lightweight in nature including Gnome MPlayer for listening to music, Iceweasel as a web browser and Claws as an email client. The desktop that comes with AntiX is IceWM which uses very little of your computer’s processing power. AntiX is based on the Debian testing branch which means the applications are fairly up to date and in the main fairly resilient. 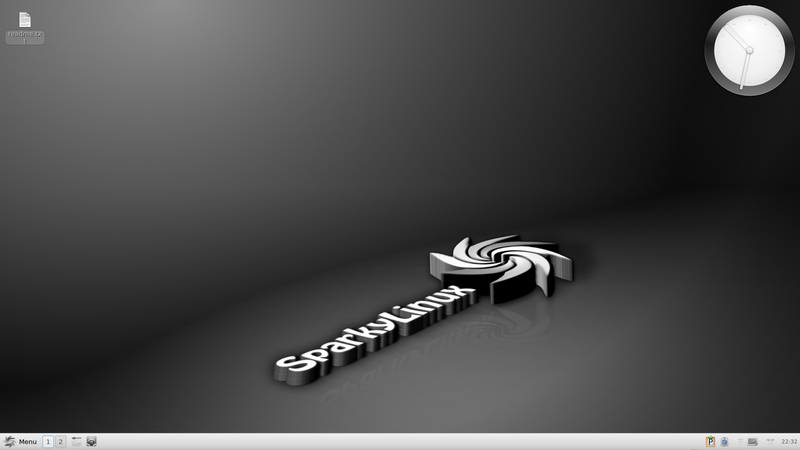 SparkyLinux is another Linux distribution based on the Debian testing branch. There are a number of choices of desktop available including LXDE, Razor-QT, OpenBox/JWM, e17 and MATE. SparkyLinux will work quite well on really old and just plain old old computers. If you have an ancient computer then the Razor-QT, LXDE and JWM desktops are the ones to go for. The minimum requirements are 256 megabytes RAM for LXDE, OpenBox and e17 or 384 megabytes for Razor-QT. You will need at least 5 gigabytes of hard drive space. I believe that the i486 versions include a non-PAE kernel making it accessible to everyone. The applications aren’t so lightweight in nature. LibreOffice, GIMP, PlayOnLinux, DropBox, Teamviewer, QMMP and VLC are installed by default. 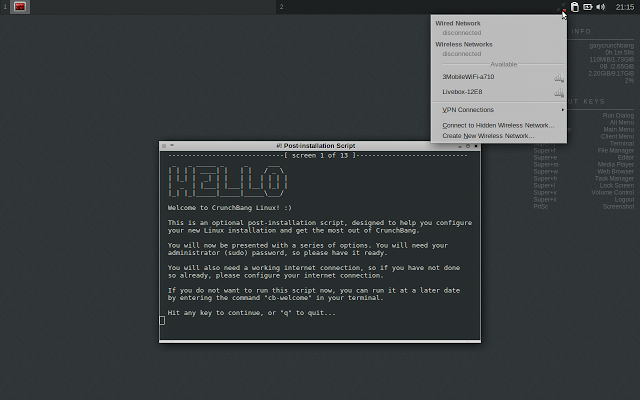 Crunchbang is also based on Debian and it uses the Openbox window manager. specifically to provide a great Openbox experience. Crunchbang is genuinely lightweight in nature and that is reflected in the applications with Abiword and Gnumeric installed instead of LibreOffice (although the option is there to have LibreOffice). The Crunchbang website isn’t overly forthcoming with minimum specifications but this forum page has people listing RAM requirements of anything from 64 megabytes to 512 megabytes. There isn’t just one version of Puppy Linux. There are dozens of them. They are all built using the same tools and are all light on resources. My personal favourites are Simplicity and MacPup but Precise, Wary and Slacko are really good as well. Puppy has a number of really good applications with small footprints including the excellent PMusic audio player. There are dozens of tools available including ftp clients, screengrabbing tools, torrent clients, CD rippers and audio download tools. Puppy is designed to run from a USB pen drive as opposed to installing it on a hard drive. (You can if you want to though). The Puppy Linux wikka page states that Puppy Linux can run on 64 megabytes RAM but 256 megabytes is more realistic with a 512 megabyte swap file. The desktop environments used vary depending on the version you install and they vary from IceWM to JWM and LXDE. 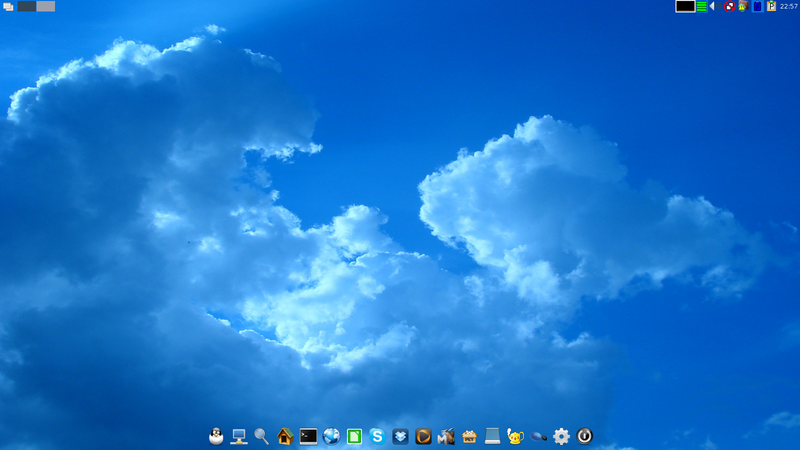 Lubuntu is based on Ubuntu 14.04 and comes installed with the LXDE desktop. 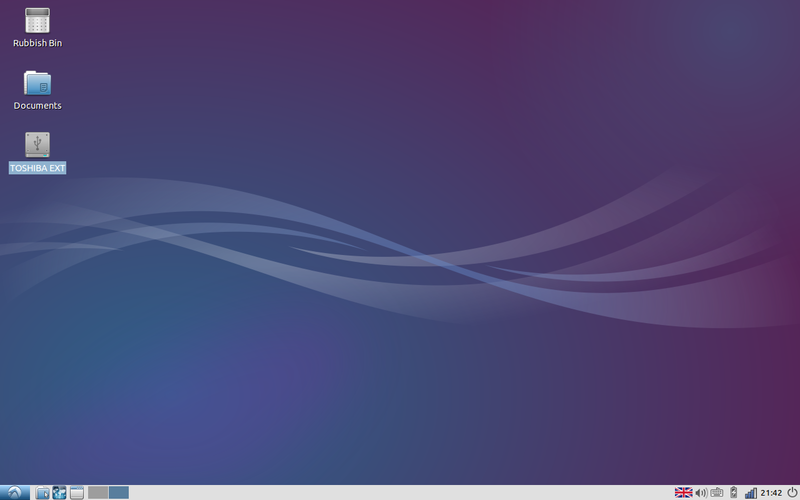 Windows users will find Lubuntu more familiar than any of the aforementioned distros. Lubuntu can apparently work with just 128 megabytes RAM but becomes more useable with 256 megabytes RAM and it is highly recommended to have 512 megabytes or more. The applications installed are all light in nature with Abiword and Gnumeric installed as the word processing and spreadsheet tools. Audacious is installed as the audio player which is decent if not spectacular. With Lubuntu you get access to all the Ubuntu repositories but your choice of applications will be determined by the amount of system resources available to you. The obvious choice for users coming to Linux for the first time on really old machines would be Lubuntu but AntiX and SparkyLinux are both worth a go. With Lubuntu you will find a larger support network. The choice doesn’t have to be Lubuntu or Puppy as you can try Lubuntu as a full installation and install Puppy to a USB drive. Crunchbang is a very popular distribution and you will soon realise that functionality outweighs shiny. How can you recommend Lubuntu 14.04 for very old computers when it doesn't support non-pae processors any longer? I guess it depends on your definition of 'old'. Balanced perspective. You will note that I listed some non-pae distros above as well. PAE has been around for a very long time. According to Wikipedia it was introduced as early as 1995. If your machine is very old but is PAE enabled then Lubuntu is a great choice. If it isn't then use one of the other distributions mentioned in the list. I just installed lubuntu on an ibm ThinkPad t40, which is non-PAE, and it runs very smoothly. At the install option screen you have to hit f6 and add "forcepae" at the end of the command line and you're all set. …. Linux is about freedom! Wattos is based on lubuntu 14.04 lts with a non pae kernel …. Don't forget "newer" Penium-M crapola laptops. That was a "newer" processor that also lacked PAE, even though it was in active use less than ten years ago. Thanks for the comment Steve. Puppy Linux is definitely unique when compared to all the other distributions around. I have always been a big fan of it and have carried it around on a pen drive for a number of years now. Sparky was no-go (LXDE & XFCE; i486 versions) on a 2004 ThinkPad (pentium M); unable to boot, so I loaded #! The 2004 thinkpad is non-PAE so can't boot lubuntu; as is my 2006 netbook (asus eeepc atom dual-core but still non-PAE too!) Used to use Mint on it; but its PAE so was unable to update to 17 on netbook due 2006-atom being non-PAE. It's now running #! (but has Kali loaded on it too). Never tried Antix; will do so. Don't mind Puppy; use it on Pentium II in garage as it'll use all hardware where others tried recognize but won't use ISA AWE-64 sound card. In the late 90's PAE was available on (pIII based) Xeon cpu's only. Desktops of that era (pIII) were not; as were later pIVs etc. PAE was available in servers ~7-8 years before desktops, about 8-10 years before laptops & 11-12 years before all netbooks. I vote Lubuntu, here is my opinion. http://opensourceandlinux.blogspot.com/ Lubuntu is a good OS replacement for XP. Puppy has terrible support of hardware- not even worth of trying. What would You recommend for Barton 2500 or Duron 2000 with 512 MB RAM? How come this are distros for very old computers but they require at least 128MB of RAM?… I mean, when we used Windows 95 or 98 for example, computers only had 64 MB. Not to say that 512 MB was a dream over those years. I can't understand the definition of "too old" because we are speaking of computers that are less than 10 years old, and that is not "too old" speaking about computers. Thanks for the article series. I have an old emac PPC G4 with 1GB of ram. I have tried to put yellow dog on it, but no success yet. Are there any other Linux distros that might work well on it? BTW, I put LXLE on an old laptop that has windows XP on it and has 1GB ram. I am amazed how smoothly it works with seamonkey/mozilla. Last night I had a concert playing via youtube while having several other pages open for reading. The CPU would bump against the 100% threshold, but everything still functioned smoothly with no interruption in the music. Not so with chrome. Linux is winning me over, though it seems I will have to keep windows around for netflix. So which of these can be used as live discs? I realized after downloading the .iso's that they might be installation discs, and not live discs. Try Archbang. The advantages of Crunchbang, still supported and the Arch repository has almost everything you would need. If you are feeling adventurous you could install Void Linux with Openbox. I got it looking and feeling very much like my Archbang install Lightning quick but not quite the same choice in the repositary. 5Gb is all you need for all your usual packages including VirtualBox. Doesn't use Systemd either.